26 meals from around the world! That is the goal I set myself this summer. Today I present all the meals in one post. My country of origin is India so I could not help but include a 27th meal from the state of Maharashtra in India. Growing up food at home was typically Maharastrian in origin. It always showcased the flavors of the ingredients with marginal use of spices. However, my parents ensured we learnt to appreciate foods from different parts of the world. As an adult I try to find the freshest produce and use spices sparingly. I also routinely cook food from different parts of the world. This is a formal effort to blog those meals. During this journey I found that our need for comfort through food has always been strong. Migrant populations over the centuries have taken with them recipes from their place of origin. They then modified these recipes using the new local ingredients, when necessary, but always tried to retain the flavors of the old. Rulers have done the same to enforce new regimes and wipe out traces of the old. Today we see the amazing similarities in food between nations separated by vast oceans. Our ability to make our food as flavorful as possible given the natural resources available is indeed a testament to human ingenuity. During this entire journey I had the support of my family who willingly ate all my experiments. Experiments that were mostly good, sometimes not so good and on rare occasions just plain bad. Then there was a hardest part of all - waiting patiently while the pictures were clicked. But I would have to say a big chunk of the support was from a wonderful group of bloggers who blog under the umbrella, blogging marathon. The motivation to cook and blog meals from different countries while working through the letters of the alphabet came from this group. The event was aptly named 'Around the world in 30 days' and there were 20 participants, including me. On each of the posts above you will find a link to the posts by the other members of this group. To each of them I say 'thank you'. Varada, it was an amazing doing the marathon with and I daily looked forward to year full meal from each country. And as you rightly said, food from some countries were so similar though miles apart across the ocean(s). It was a nice experience trying so many international cuisine at home. Truly a wonderful experience. I too normally cook cuisines from around the world. .but showcasing it is another experience. All your posts have been very well planned and with lot of effort which shows so clearly. Kudos and once again stupendous work. U amazed me with ur beautiful choices of making full meal for each country, seriously its really fabulous to know more about 'The meal' from various countries.. U simply rocked, kudos to u Varada. I love the collage Varada. Good presentation of all the meals from the world! 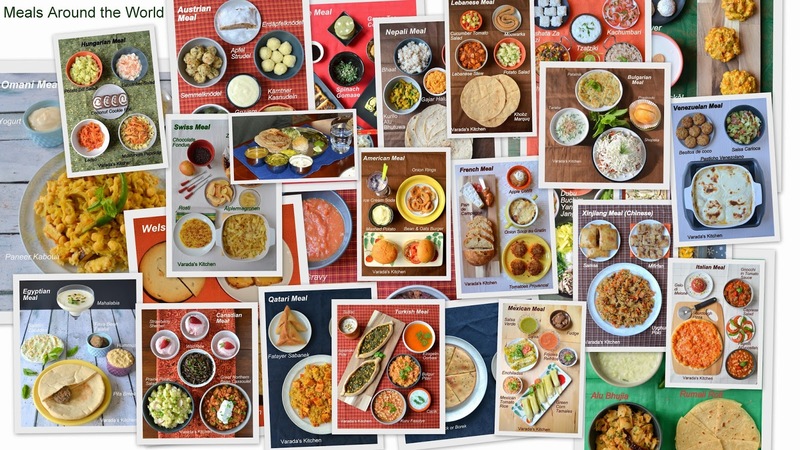 Varada, hats off for pulling off such an amazing list of meals across globe..I enjoyed reading your posts so much and always looked forward to check what meal you cooked..great efforts!